Many people may have veins that may be more visible as compared to the others. It often makes them ask, "Why can I see my veins?" or "Why are my veins so visible"? The thing is that you don't have to worry a lot about this because you will see your veins to a certain extent and they look blue because they take deoxygenated blood to your heart (that doesn't apply to umbilical and pulmonary veins though). Your body has millions of veins and they are usually visible on your legs, arms and chest, but they look more prominent on muscular forms, pale skin, and legs. It is normal in most cases, but you should know a bit about it to make the right call. Is It Normal If I Can See My Veins Through my Skin? Generally, it is normal to see your veins through your skin. As for the question "why can I see my veins through my skin", the answer varies. It could be because you have very translucent skin that's hard to hind the veins below or because your big veins are a little too close to your skin. This could also be a hereditary condition, and you should consult your doctor if you have just recently started noticing your veins becoming too prominent. You have visible veins maybe because you're involved in a stressful activity – this is when your veins dilate and get wider, and they may also look blue, green, dark blue, purple and even black. You may be able to fix the issue by relaxing, taking plenty of sleep, and drinking catnip tea. If you say, "Hey, I can see my veins through my skin, and I don't think it's normal" keep reading and you will have the answer. These types of veins are quite close to your skin and may be seen through the skin. They are more prominent in your legs where they move blood and transport a small percentage of blood to your heart as well. You may have a fair skin complexion that makes your veins more visible. It may also be easier for you to see your veins if you're thin – it usually means there's little fat to hide your veins. Your veins may become more noticeable if you lift weights. The blood vessel may become rigid and bulged due to the pressure you put on your body when lifting weights. If you continue with strenuous exercising routines, you not only build up your body, but also make your veins more visible. It is worth mentioning that weight lifting itself doesn't change your veins, but it actually changes the appearance of your muscles around your veins. As your muscles gain in size and density, the ridge muscle wall can make the veins visible even when you are relaxing. Sometimes veins in your legs may enlarge due to different reasons. 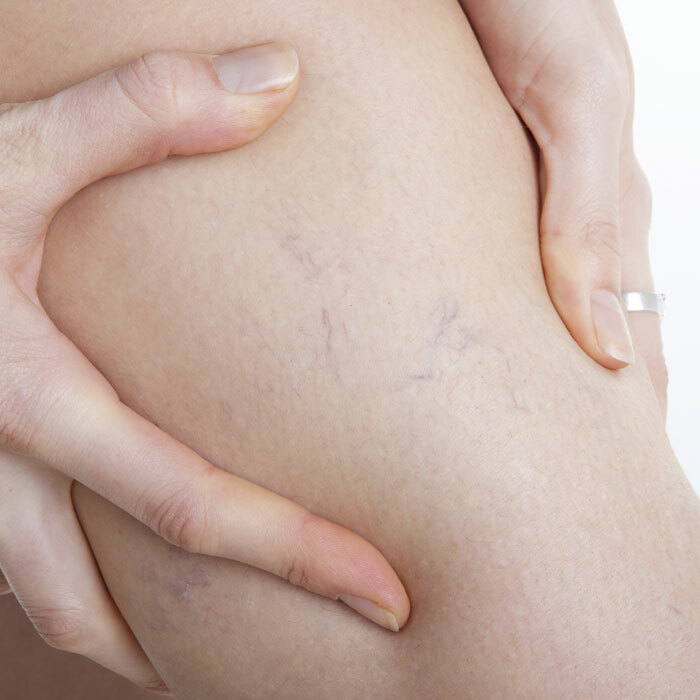 These veins are referred to as varicose veins. These veins are larger than normal ones, so it makes them more visible through your skin. This usually happens because the valves in your legs may not be working properly to pump blood back to the heart. These veins can be quite painful, especially when you stand for some time. Your veins will become more visible as you age. In children, the layer of fat under the skin is usually quite thick, so it is difficult to see their veins. The layer is usually thinner in women than in man and becomes even thinner with age. If you're a smoker, this may also create aging effects and make your veins more prominent than before. You may be on medications that can trigger thinning of the skin. This usually results in your veins becoming more visible. You should avoid using steroid medications if you're concerned about your overly prominent veins. Sometimes, your body starts producing too much of steroids, which usually happens in Cushing syndrome and make your veins too visible. What Are Other's Opinion on "Why are my veins so visible?" "You don't need to worry because it's common to have visible veins. It means your circulation system is good. It may also mean you stay a bit stressed and anxious most of the time. Do you have a faster pulse rate? It usually mean your heart is pumping fast to make blood travel fast through arteries and veins." "The simple solution to visible veins is to get a light tan by wearing a protective sunscreen. Your skin tone is just fairer than the most, and there's no need to feel concerned about it. Yet another thing you may want to do is take more vitamins to ensure your visible veins aren't due to poor diet." "You may have visible veins due to dehydration. It is important that you drink plenty of water. Your translucent skin may also be the reason behind your overly visible veins. While it may look unsightly at times, there is usuallynothing to worry about. Just avoid dehydration to ensure you don't make those veins more prominent. Also, make sure to eat balanced diet to provide your body with enough nutrients and vitamins to function properly."